Light-Channel Therapy focuses on a harmonious flow of Light – ch’i, life force, or vital energy – in the body by dissolving blockages in the meridians, the subtle energy-channels. Born clair-sentient, Trudi is able to feel the energy flow in man and nature. Through the astonishing results she witnessed in her work as a health practitioner and sensitive healer, Trudi has developed a new healing modality. This gentle hands-on therapy stimulates the entire energy system and releases any blockages. The vital energy, the Light, can once again flow freely. Healing angels are present at each treatment. Trudi also became aware that an invisible, wonderful network connects the body to the Cosmic Light, and clients open up to these high vibrations. Thus she came to term her healing work Light-Channel Therapy. Ultimately it is aimed at a re-orientation of body and spirit within the cosmic order of the universal Christ Light. The effects of Light-Channel Therapy are truly holistic: this healing modality is not directed at individual organs or parts of the body, but supplies body and soul with fresh amounts of the intelligent light force. Light-channel work has a stimulating, harmonizing effect on the energy system. It actives the auto-immune system. Through the elimination of energetic blockages the soul as well is restored to health, as negative moods, depression, anxieties are transformed. has a relaxing, healing effect on body and soul. Through the gentle laying-on of hands in a specific 14-steps-procedure it has proven to restore health and soothe emotional or physical problems in a huge number of clients. is a new healing modality: it is simple, effective, and holistic. It connects the light of the soul with the body while activating the body’s auto-immune system. is a spiritual meridian therapy: while firmly based on the ancient Chinese meridian system and teachings, it expands to include the loving support of the healing angels. is in accord with the growing awareness that the true cause of any health disorder lies in a disharmony of the energy system. Balance is restored by releasing blockages. Light-Channel Therapy is a complementary healing modality to eliminate energetic blockages and restore health for body and soul. It is not meant to replace professional advice and medical treatment! Trudi has spread the healing modality developed by her through book publications in a number of countries, as well as through seminars, CDs and an instructional DVD. 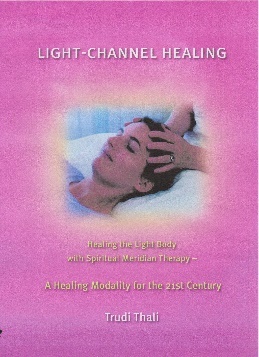 The basic manual is Light-Channel Healing, Lotus Press 2005 (in German Lichtbahnen-Heilung, Windpferd). Besides in English this much-acclaimed work is available in 9 languages. Trudi’s book Lichtbahnen-Selbstheilung, Windpferd February 2005 (Light-Channel Work for Yourself), further explains how the therapy founded by her can effectively be used for self-treatment. Here Trudi also leads the reader into deeper awareness of healing empathy and the Light-Consciousness. The classic manual for Light-Channel Therapy. A bestseller. 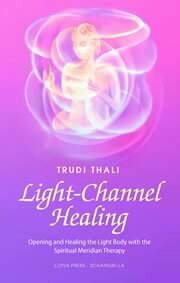 Simple, positive and easy to follow guide with suggestions for Light-Channel healing for yourself and others. Based on the ancient Chinese meridian teachings, Light-Channel healing focuses on a good flow of light and vital energy by dissolving the blockages in the meridians, also called the energy channels. -how empathy and gentle touch can create powerful results. Discover a truly holistic way to pray! 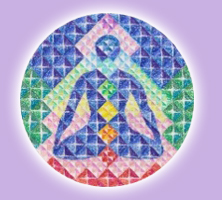 Activate the Divine Light within your chakras and energetic body! Each sentence of the Lord’s Prayer that Jesus Christ taught us is a powerful healing mantra. 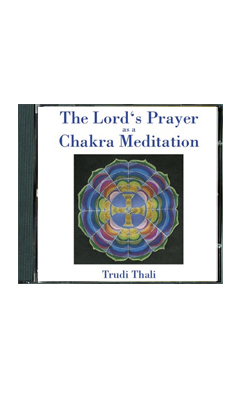 The guided meditation on this CD combines the most sacred prayer of Christianity with the seven chakras. You will feel a healing power flowing through your body, and enjoy a wonderful spiritual opening to the light of the Lord. This new way to pray helps you to connect with the Source of Light. The vibration of the Lord’s Prayer, as presented here and accompanied by specially composed music, will open your chakras, promote the flow of life-force and establish communion with the Divine Source of Light. a light-filled, wonderful sacred sanctuary.